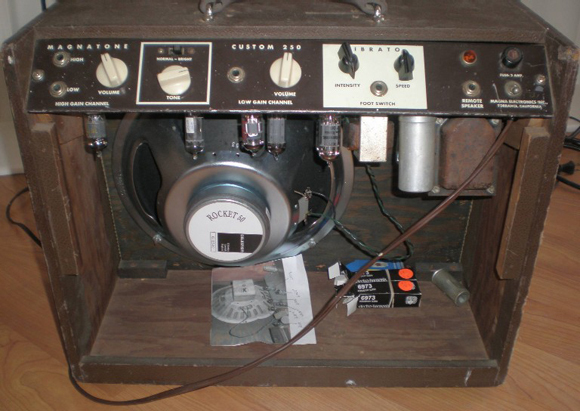 This month is the first part of a two-parter about Vintage Magnatone Amplifiers. This month, I’ll be focusing on one underrated and rare model, while next month I’ll break down the 5 distinct collectible (i.e. tube and mostly vibrato) periods of Magnatone Amps (from the late 40s to the late 60s before they went to Solid State models in the late 60s before going belly up in 1971). A quick aside about the difference between Vibrato and Tremolo (and feel free to read ahead if you know all this inside out). Vibrato is a modulation of the pitch of the note. Tremolo is a modulation of the volume of the note. Why do they get confused so often? The main reason lies mainly on the mighty shoulders of Leo Fender (though others were guilty too, such as, among others, Nat Daniel in some of the early 50s Danelectro’s). On just about every Fender amp labeled “Vibrato”, the amp actually has Tremolo. To add even more to the general confusion, Fender insisted on calling the whammy bar on the Stratocaster a “synchronized tremolo system” when, in fact, a whammy bar (perhaps obviously) changes pitch—not volume. So, in short: MOST amplifiers, no matter what they call it, have Tremolo. Many (though NOT all, and this will be covered more fully next month) Magnatones have true pitch-shifting Vibrato. 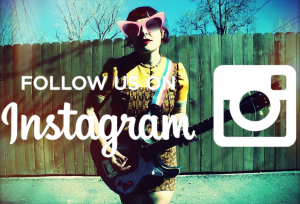 (There ARE some brown Tolex Fenders and a couple of Ampeg models that have a Doppler-like type of Vibrato, too, but they are not the most common in those respective companies’ lines). So, what’s the big deal? Well, the two effects, while both sounding musical and beautiful, don’t sound much alike. It’s very difficult to describe the Magnatone’s version of Vibrato (which is the most musical I know of—far more than, say, a Uni-Vibe or some other solid state outboard version of the effect). I need to start doing sound clips with this column—perhaps in the near future. But, back to the case at hand. The Magnatone vibrato can go anywhere from a subtle flutter to a truly intense amount of fluctuation, without ever giving you the sea-sickness than many vibe and chorus pedals can offer. And once you’ve heard it, especially with some Reverb and an extension cab (with you in between the two sets of speakers)? Wow. There’s not another guitar sound like it. As I say, there will be more about various collectible models of Magnatones next month—the similarities and differences among the different periods of production and so on. But for this month—just one collectible rare gem: The Magnatone Custom 250. One look at the control panel reveals a surprisingly minimal amount of controls (yet, paradoxically, it’s an amp with a LOT of tonal variation). The first (High Gain) channel has two inputs for high and low gain, a volume knob, a tone knob and a “bright” switch. The 2nd (Low Gain) channel has only a volume knob and is a great for mellow, jazzy tones. Next are the speed and intensity knobs for the vibrato, with a foot-switch input for the vibrato and an extension speaker ¼” out. Except for the on/off switch and a VERY cool red jewel light with a “M” in the middle of it, that’s all there is across the front. And yet, as I say, you can coax a lot of usable tones from this for the studio or the stage. And, like with the great Magnatone 213 (again, to be covered next month) or, say a Fender Tweed Deluxe, the volume controls on the 250 are interactive. That is, you can turn the volume knob on the low gain channel 2 (when you’re plugged in to channel 1) and it will have a noticeable effect on the gain structure of channel 1. Very cool. As best as I can tell from my catalog collection, the 250 was made between 1958 and 1961 or 1962 by Magna Electronics, which was based in Torrance CA at the time this amp (a 1959) was made. Like most Magnatones of the “brown” era (i.e., 57-62), it has an ALNICO Oxford speaker (mine’s in storage, while this model pumps through a higher efficiency Celestion for more gig volume). And, like many (though not all) Magnatones of this and later periods, it has some relatively unusual tubes—though all for this model are pretty easy to get, unlike some great Magantones in the suitcase line (to be covered next month). This amp pictured, just in the interests of historical accuracy, has a replaced handle, is missing its back panel, and has two chicken-head knobs (on Speed and Depth control) instead of those beautiful white ones on the rest of the amp. Gear geek paragraph alert: In the preamp, pitch-shifting and phase inversion duties, the 250 has one 12AX7 2 6GC7s, a 12DW7 (which is actually HALF of a 12AX7 in the same bottle with HALF of a 12AU7). The 12AU7 side is the phase inverter, driving two 6973s. If you aren’t familiar with 6973s, they are the tubes that were used in many Valco products from the 60s—perhaps most famously in the Supro Dual Tone (24T). You also see them, frequently, in 1960s Univox amps, and their various re-brands such as Lafayette. The rectifier tube in the 250 is the unusual (for Magnatone) EZ81/6CA4. But back to the 6973s. 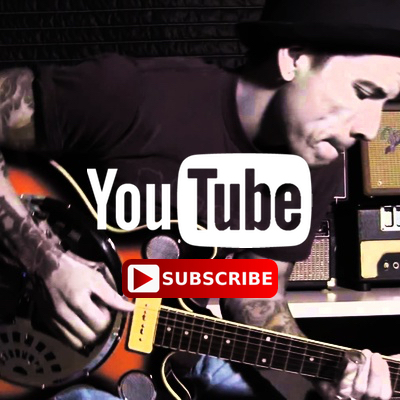 While the circuit determines more of the tone than many people admit (thanks again to Mack Amps’ Don Mackrill for helping spread the word on how important design is—that’s a big reason why, for instance, a Gibson Minuteman, a Fender Blues Jr. and a Vox AC15 sound nothing alike, even though they all use 2 EL84 tubes for output), the 6973 tube has a very cool gain characteristic all its own. It’s a very durable and a stunning clean toned tube (hence its use in so many jukeboxes of the 50s and 60s.) But push it hard, and it gets a real Vox-like chime on the high end and a wonderful Supro-like guttural midrange honk. It’s rated, in Magnatone literature of the time, at 20 watts. Mine pictured here gives my Silverface Deluxe Reverb (a plenty loud single 12” combo) a good run for its money, volume-wise. These are pretty rare, but they are WELL worth seeking out on the vintage market (as are many of the less rare models to be covered next month). In short, this is a very versatile tube that can give you beautiful blooming cleans and some very nice crunch, followed by some creamy lead tone the harder you push the volume. And, of course, it has the radical and head-spinning real Vibrato. Hard to beat in a gig-volume single 12” amplifier. 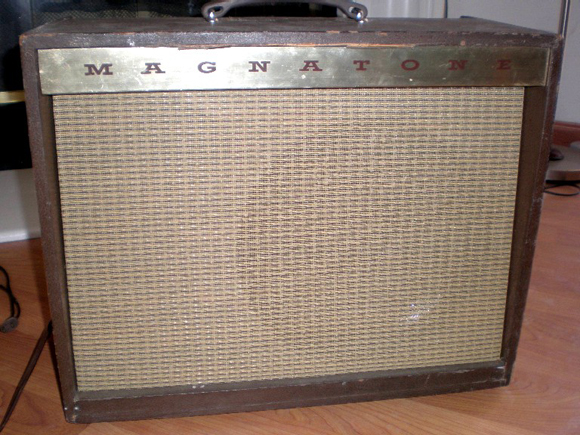 I have a friend that has a magnatone 213.The cover or tolex is off of it and the cabinet is constucted of plywood.It has original tubes and alnico speaker. Has some problems . It will only play at low volume. He wants to trade for my blues jr. what do you think? plus I have a very old magna tone amp. I had rebuilt and I use it for my harp playin.It has a great sound breaks up well. From left to right. it says 110 V.50/60cyc 54 watts below that a fuse next a red light below that a large MEC magna electronics Company below that los angeles california next to right Tone then master volume, next mic volume then microphone input and 2 guitar inputs andabove that serial no. 5429 and the tubes and transformer are on top,plus it has three choices for om out puts.Roger Coleman What do you think? Hey hey hey!! I wrote a message lasdt night it says its awaiting moderation? Ihave a chance to trade a blues jr. (in good condition ) for a 213 magnatone not in playing condition. But its all there and has not been cut up or changed and has the original alnico speaker. What do you think and did they make alot of those? Thanks Roger and out!!! Hey there, nice article. I found a magnatone 260 in someone was throwing out in the trash! Thanks for the great info! I have a friend that acquired a 2X12 version.I forget the model,but the vibrato was mesmerizing.I still cant figure out how a mono amp can sound stereo.Its better than any chorus Ive ever heard including the JC120 and Im still a big fan of Rockman Chorus. I have a friend in Texas who has his dad’s Magnatone in his garage on a shelf. I asked if he actually knew what he had, “yeah, My dads old junky amp”. “We keep it around to remember dad”. I told him to take it down, have it checked out and play that thing…. Hey, there was never a part two, was there? Please do something on the M-series “suitcase” models – with the glowing M! mmmmm. yessssss.. I have a magna electronic model 108 amp. Are you interested? I have a MAGNATONE Custom 250. All original! What’s it worth?